To sign up to the Blue Sea Holidays Newsletter, simply click the Request Newsletter button below and you will receive amazing special offers, discounts and access to secret sales. Have you ever had to settle for less whilst away? With Blue Sea Holidays you won't ever have to again. A reinvigorating holiday to paradise should be for everyone. Blue Sea Holidays are committed to providing high–quality getaways for all ages to some of the best European destinations on offer. Discover how easy planning a holiday can be and experience luxury without the price tag. 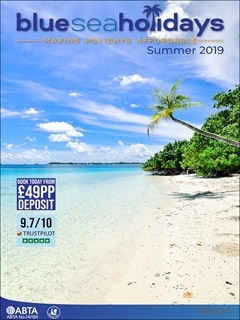 Summer 2019 - Greece, Spain, Turkey, Balearics - Book early and save £££'s. Secure your dream holiday with a £49pp deposit! Blue Sea Holidays lets you tailor accommodation to suit your tastes, budget and group and choose a holiday theme that'll keep you satisfied throughout. And with their exclusive Newsletter, you'll see how easy it is to make your money go further. With their range of options, flexible extras and low deposits from £49 pp, no one need be left out. So craft the ideal holiday you've been waiting for. Blue Sea Holidays Newsletter Jas G. said: Good selection of holidays. By Pressing the Request Newsletter button you give Blue Sea Holidays (and their Data Processors for the specific purpose of delivering your emails) consent to send you their newsletter via email until such time as you choose to unsubscribe.